The purpose-built TeraFlex JK 2-Door Nebo Roof Rack 4-Piece Cargo Slat Kit adds even more utility and versatility to our Nebo Roof Rack Main Rail Kit. This cargo slat kit incorporates OEM aesthetics and styling with rugged performance to increase cargo carrying capacity for your adventures. The low-profile streamlined design has been tuned to reduce air resistance and noise when unloaded. The 4-Piece Cargo Slat Kit provides a platform to hold gear and allows direct mounting of popular sport equipment carriers without requiring the use of a load or cross bar. This cargo slat kit must be used with the JK 2-Door Nebo Roof Rack Main Rail Kit. The Nebo Roof Rack Main Rail Kit (# 4722020 or # 4722030) features universal accessory mounting capability. • Static load rating of 850 lbs. • Dynamic driving load rating of 200 lbs. • Total weight added including the main rail kit is 24 lbs. • Requires JK Nebo Roof Rack Main Rail Kit (# 4722020 or # 4722030). • JK Nebo Roof Rack Main Rail Kit requires drilling into factory hardtop. • 4-Piece Cargo Slat Kit also available in silver (# 4722052). • Cargo Slats are available individually (# 4722061 or # 4722051). 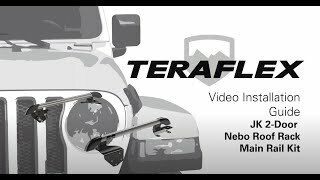 • The TeraFlex Nebo Roof Rack is designed to accommodate the widest range of equipment carriers on the market. These equipment carriers can be attached to the main rails, the cross slats, or by mounting the carriers cross load bars to the main rails. This will provide a safe and secure mounting point that is as low profile as possible to reduce wind noise. Because the TeraFlex Nebo rack utilizes industry standard 10-series T-slots, equipment carrier compatibility is maximized with minimal adapter components required. • Although it is a relatively easy process to attach these equipment carriers to the Nebo Roof Rack, there will still be some customizing that must take place. This is most commonly done through adapters provided by the equipment carrier manufacturer (Thule, Yakima, etc.). • Please review the Nebo Roof Rack instruction file found below prior to purchasing or installing the rack. This will give you some insight into the different mounting configurations and adapters that may be required to mount specific equipment carriers to the Nebo Roof Rack.